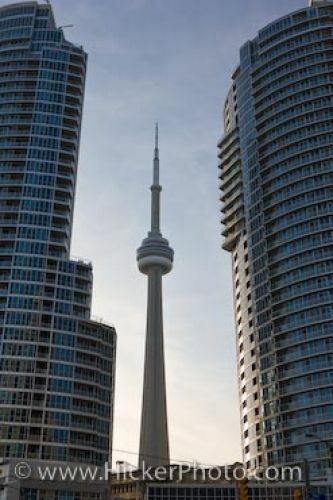 The unique design of the CN Tower stands between two sleek modern buildings in Toronto. This observation tower is the third tallest free standing building in the world. The Canadian National is a railway company that built the tower. The tower serves tv and radio communication to the Toronto area. CN Tower in downtown Toronto, Ontario, Canada. Sitting between two tall buildings is the CN Tower in downtown Toronto city, Ontario.